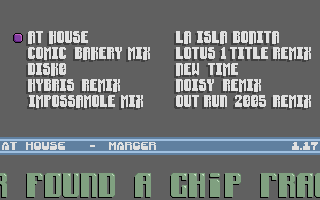 A nice music disk by Marcer (Atari Legend) and Paradize. Have some problems with it on Falcon, but I think it will be fixed very soon ! Nice disk! Maybe i'm getting old but i find the scroller goes a little bit too fast. It's a Amazing MusicDisk !!! Simply R0x! not all the songs were to my taste, but many of them were and i enjoyed listening to this nice disk. Lotek was right by the way: I would have prefered less remixes and more original tunes too. Thanks, for the feedback's. I did those Covers for learning more about chip music creation. So in future you will get more my own stuff. Unless I get any cover requests. nice chipdisk.. the madonna cover is cool indeed. personally i dont have too much relation to the other song originals. nice gfx too! hope to see/hear more from you! page created in 0.016102 seconds with 15 queries.